Within the confines of an intensely rigid culture – the upper tiers of Victorian high society – four rebellious characters choose to follow their hearts and desires in romantic affairs that don’t go unnoticed! Modern ideas of love and freedom collide with strict morality in this enchanting Romantic Comedy set in 19th Century New Zealand. 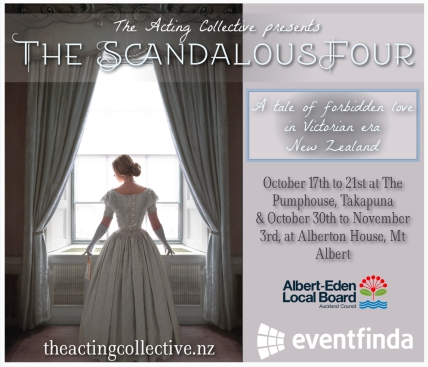 Brought vividly to life by players from The Acting Collective, this delicious drama unfolds in the historic setting of Alberton, an epicentre for Auckland’s elite in the 1870s and 80s. In the opulent parlour, experience this classic Drawing Room Play – a genre of intimate 19th century theatre both performed and set in the parlours of the well-to-do, laced with self-referential wit and wry social critique.